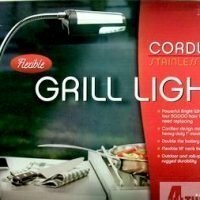 Lets begin by addressing the grill lights price, this one is on the low-end of all the maverick grill lights so all we won’t really expect a whole lot from it. 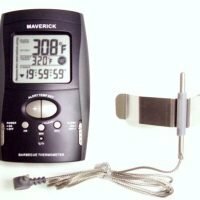 You can find some other grill lights out there slightly cheaper (not by much) then this one but Maverick has been making quality grilling products for as long as we have been around so the brand name does seem to make it worth the extra couple of bucks. Cordless design mounts anywhere with 1″ spring clamp. 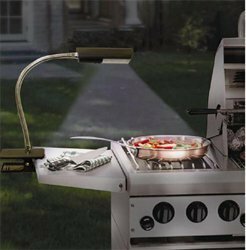 In its package: This particular clip on grill light comes in a clam shell display package and it looks really nice like a huge book light. Our first impression is that the neck appears to be quite long, because it is bent around almost the entire package. For as good as products look in these they have to know what a pain they are to open. Some added points for being able to recycle all of the packaging materials though. 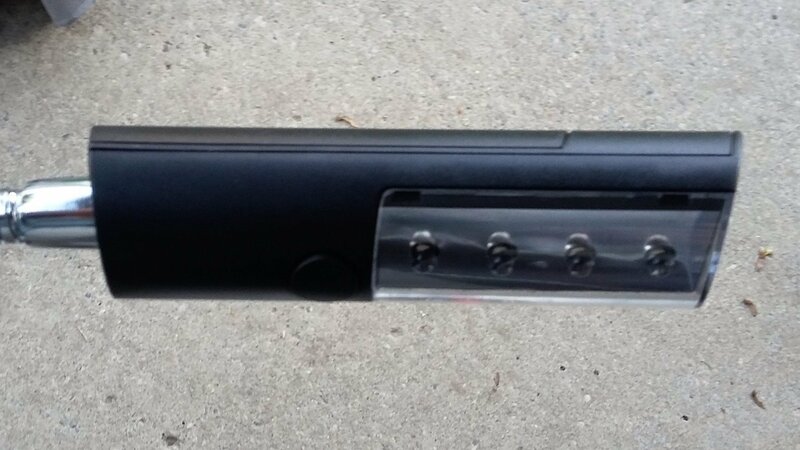 The black plastic spring clamp also looks to be very large. You also notice the 3 off brand AAA batteries that are included (3 not 2 or 4 three that’s strange). The head of the grill light is made of black plastic and tube-shaped you can see the 4 LED’s and a light reflector. 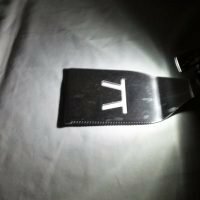 Once we have pried our new clip on grill light from the death-grip of its clam shell container we find it also includes a small instruction sheet. Which I promptly threw away, I am a man after all. Along with most of this type of item anymore we see that it is made in China. So the first thing we do is play around with its flexible neck. It does seem to bend and stay put just about anywhere we put it. Next up is messing with that large clamp. It is a little difficult to open, I guess it should be if we want it stay put. Inside the clamp on ends are pads that are rounded inside. Probably for clamping onto edges of side tables and handles. This clamp is this grill lights biggest drawback. As stated on the package it only opens one inch wide we could get it to open a little wider though. This really limits its usability on gas grills where side tables can be up to 3 inches thick. Now where do the batteries go? We could probably read the instructions but we already threw them away. I find the hatch on the top of the light with the standard thumb grip push pad and push. The cover pops right off exposing the battery slots. They make no claim about this clip on grill light being water proof but I still check the cover for an additional seal and there is not one. I however will state that at the very least due to the round design of the head of the light and the battery cover position it should at least be water-resistant. It would be easy enough to make it waterproof with a baggie and a twist tie or electrical tape. I cut the batteries out of the shrink-wrap and install them, (three batteries is weird right?) and close the battery hatch. The power button is a push button located near the LED bulbs on what is the underside of the light. Let’s push that button and release that whopping 4.5 volts of power. With the light on in daylight you can definitely see that the clip on grill light will do its job but the real test will be when night falls. For now lets see where we can get that small clamp to mount. It clamps onto our patio table just fine. 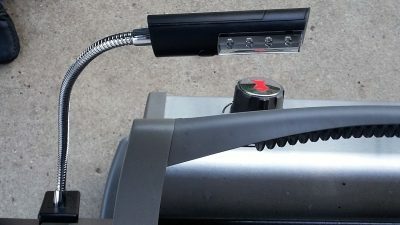 On our Weber Spirit we found we could clip it vertically onto the 3 inch thick side table and bend the neck into a usable position as well awkward but functional. 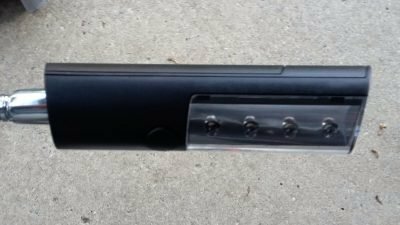 We could clip it onto the grills handle as well, the long neck just put it into a very odd position that we did not care for. 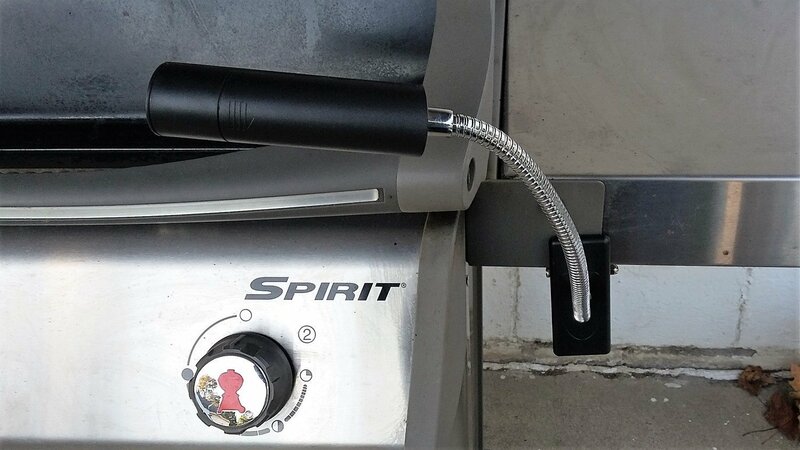 The best mounting position we found for the clip on grill light was on our Weber Kettle grills side handle pointing inward. It looks like that it is tall enough to sit out-of-the-way and not really interfere with the lid when positioned properly. 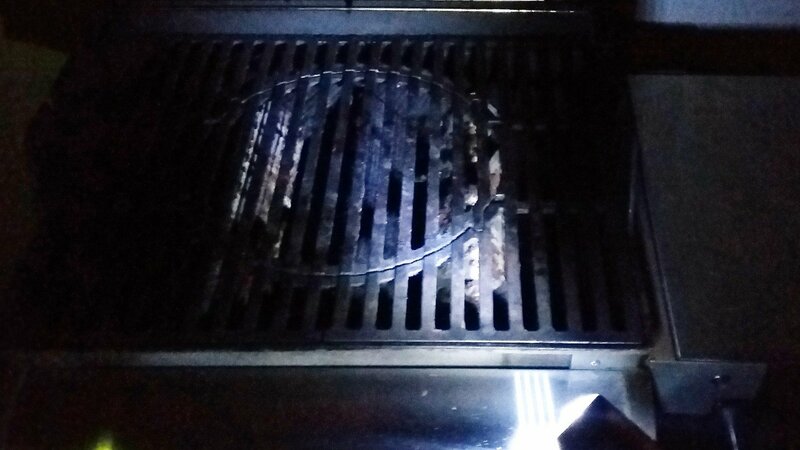 As you can see by the picture it does a real nice job of lighting up the entire grill. 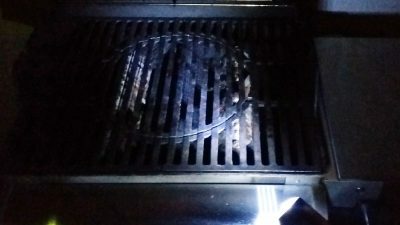 As you can see in the pictures and the video this grill light does its job. 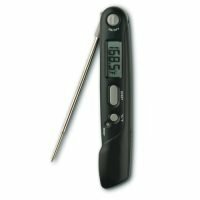 It is not like having a large flashlight over your grill but it does serve it’s purpose and allow you to see what you are grilling and read your thermometer in the dark. 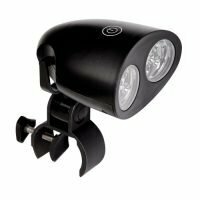 You can probably attempt to improve the lights performance by adding brand name batteries. 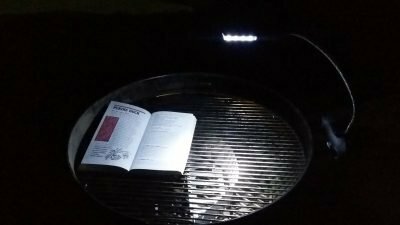 After all our testing was over we left our clip on grill light on to see how long the batteries would last and that was for a full four hours. 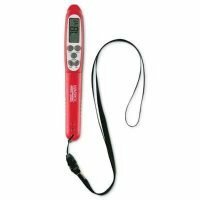 Add in our testing time and out of the package you will probably get around 5 hours of use before having to change out the batteries. 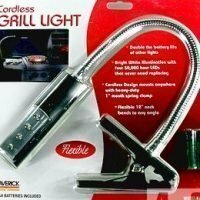 The bottom line: If you are on a budget looking for a clip on grill light for your kettle grill this light will work for you. Any other use you may want to pass on this one. 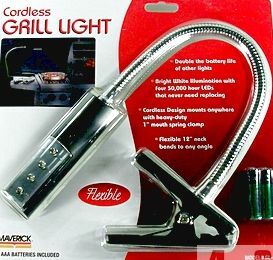 For most gas grills we have found a handle mounted grill light is what works best for us. Three batteries is weird right? The light isn’t very bright but does the job the flexible neck works well to. The major drawback with this is that 1 inch clamp. It really limits where you can put it on a gas grill.